The U.S. Department of Transportation‘s National Highway Traffic Safety Administration just released statistics for 2012 for auto and large truck fatal accidents. There are three reports, which provide a wealth of information about fatal accidents in the U.S. In this blog post, we’ll concentrate on the first report, which analyzes all data from all of the accidents combined. In the United States overall, the number of fatalities in 2012 is 33,561, up 3 percent from 2011. Kentucky reported 746 fatal accidents, up 4 percent from 720 fatalities in 2011. Tennessee’s percentage of increase was higher, with 1,041 accidents reported, an 8 percent increase from 937 fatalities in 2011. 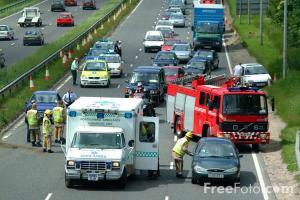 Thirty-seven states showed an increase in fatalities from 2011 to 2012, the report indicates. Taking a longer view of trends, the number of fatalities is on the decrease, with 863 fatalities in Kentucky in 1975 compared to 746 in 2012. Tennessee has experienced a similar drop, with 1,126 fatal wrecks in 1975 compared to 1,041 today. The report also tracks factors involved in accidents, including alcohol impairment. In 2012, alcohol-impaired driving, in which a driver had a blood alcohol concentration of .08 or higher, was involved in 31 percent of traffic fatalities. In Kentucky, the percentage of fatal accidents involving alcohol was 23 percent, which is down from 24 percent in 2003. In Tennessee, 29 percent of fatal accidents involved a blood alcohol concentration of .08, which is down from 31 percent in 2003. A decrease in the number of drunk driving fatalities is always good news, but alcohol is still a big factor in fatal accidents. Speed is another big factor in fatalities. In 2012, 10,219 fatal accidents involved speed nationwide. In Kentucky, 151 of 746 fatalities involved speed, and in Tennessee, 197 of 1,014 fatal accidents involved speeding. Seat belt usage can drastically affect a person’s ability to survive a wreck. In 57 percent of fatalities in Kentucky in 2012, the person who died was unrestrained. In Tennessee, the percentage was about 52 percent. The report also examines observed seat belt usage by state. Both Kentucky and Tennessee report about 84 percent of those on the road use seat belts, which significantly improve a person’s ability to survive a crash. Statistics don’t always tell the whole story. The numbers point to trends and can indicate where advocacy is needed to encourage safe driving. Anyone on the road, whether in the back seat or front, whether child or adult, absolutely should be wearing a seat belt. If you’re on a motorcycle, please drive safely and wear a helmet. No one should drive if they feel sleepy or have had too much to drink. If in doubt, don’t drive. Find someone who can drive for you, take a taxi or wait it out until it is safe to drive. Speeding also adds an element of extreme danger to driving, as we see often when we help investigate wrecks for clients. Today’s cars are very sophisticated and can tell how fast your vehicle was traveling prior to impact, so if you cause a wreck while speeding, you can be sure it’s going to be used in court against you, or help prove your case if you were abiding by the law. If you were involved in a traffic accident, you need a lawyer to help you navigate the legal system and fight for your rights in court. A good lawyer can also help you negotiate with insurance companies and ensure that you receive the compensation you deserve. Contact us at (270) 781-6500 or through our contact form if you’d like to speak with us about your case.